My time living in Paris is drawing to a close, I am about to set off on a new adventure in Brittany. I guess the end will be a mixture of sadness but relief. I moved in 1999, with a few possessions, a job to go to, no friends apart from who lived outside Paris, who I had not seen for a while. My time living in Paris has been a rewarding experience. It has so much to offer in terms of culture, big events such as the Fete de la Musique, Nuit Blanche, but also lesser documented events put on by associations and organizations. The last event I was involved with was an event organized by an organization called Paris Lit, in which poets, songwriters and writers have the possibility to do short renditions of their work in front of a hyped up audience. The event took place just after the terrible events in Paris, last November and these events impacted some of the works being performed. The two terrorist attacks also impacted my decision to leave Paris. These days in the back of your mind, when you are traveling on the metro for example you think the worst could happen . Paris is a great city with so much to offer but also a stressful city. I have many memories of my time living in the fifth district. I got married in the Marie (town hall) a magnificent building. I used to live in a well-known tourist haunt, Rue de la Huchette. When we walked out the door on a Saturday night, we used to stumble over a multitude of tourists. We would go to sleep to the sound of jazz, as the music from the next door jazz club used to seep through. I never actually went into the club, but I felt its presence every night. We used to go for walks by the Seine, in summer, watching the Bateau Mouches pass by, their lights lighting up the surrounding area, as darkness drew in. There would be picnickers eating lavish meals and musicians busking. In one particular area there would be dancers doing Breton dances. It was such an endearing lively area. Not far from where we lived was place St Michel, where street performers vied to get tourist’s attention. When you walk around Paris you sometimes forget you are constantly passing through places steeped in history. Walk around La place de la Concorde and you are walking around a place used executing aristocrats as well as royalty King Louis XVI was executed on 21 January 1793. There will be things I won’t miss for example… transport strikes. Sometimes arguments on the metro in Paris can grow out nothing. Somebody nudges/bothers somebody, next thing a shouting match develops, with all manner of accusations and slurs. So now I am leaving all this behind, moving to a place equally filled with history. A place with a wonderful coastline. Brittany also has its own strong culture. One chapter closed, another about to begin. Last Friday’s events brought about a senseless waste of life, as well as much pain and trauma to those caught up in an unimaginable horrific situation, as well as leaving many others in deep shock, but if it was the intention to try to destroy the rich culture and the desire to share creativity in Paris,they failed. Last night I was lucky enough to participate in a wonderful typically Parisian cultural event, called “Paris Lit Up”. Musicians, poets and writers all shared their feelings and ideas. We had honest accounts of failed love affairs, an interesting account of what Paris was like in the 1980s, when smoking was permitted almost everywhere. There was a rendering of a gospel song, done acapella style. There was wit, repartee and banter between participants, while at the same time some chose to share their thoughts on what happened at the end of last week. The shadow of last Friday still remains and it etched on the minds of many, but Paris retains its characteristics, a city brimming with culture and creativity, which so many love and cherish. If you have ever lived in Paris or stayed for a long time, you will know what Paris has to offer. We can’t change what happened last Friday, but creative people can stand up and say...we’re not going to change our lifestyle, because of people with twisted minds who want to destroy so many things we hold true. Not very far from the bar with the guillotine (it has since been removed, perhaps it made too many punters jumpy, fearful what happen to them if they didn’t pay up at the end of the evening…) is the place where Marie Antoinette was kept before being shunted off to meet the fore-mentioned method of dispatch, the guillotine. The place named La Conciergerie (an infamous place in the reign of terror) were meager to say the least. Another place I have visited are the Paris catacombs, a place where many skulls and other bones are kept…to form the world’s largest grave…the so called “empire of the dead”. I went there on a “night time” illegal tour. I would not do this again, it is a fascinating place, now smothered in graffiti. If you happen to choose an illegal trip down the catacombs, firstly go with some experts, who have a map and know their way round…secondly if you are spotted by the police, you are liable to a fine. 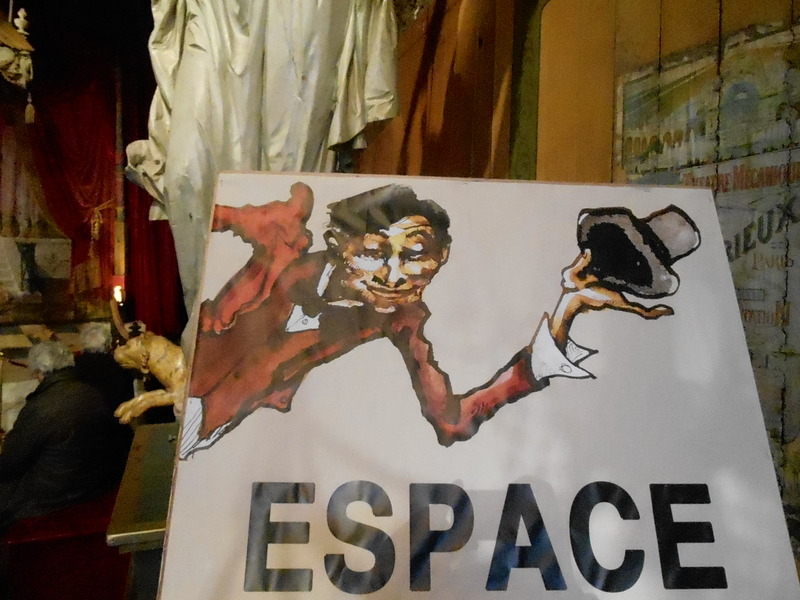 If you want an above ground safer destination, you could go to the Musée des Arts Forains. The problem is this a private museum…that is not normally open to the public. I was fortunate enough to go last Christmas, when the museum was opened for a short time to the public. It is a museum, which was opened as a labor of love by a man called by Jean Paul Favand. If you visit this museum you feel like you are being transported back in time…into the world of fairgrounds, with old merry-go-rounds. There are many quirky antiques, gathered together by the proprietor, an antiques dealer and actor…who seems to have had an eye for the theatrical…It is like being brought into the a Tim Burton type microcosm. You would need to check the museums website to see if it is possible to visit. It seems to be used as the unusual setting for lavish parties and events. On the day I went, there were musicians, performers and circus acts including the incredible Zaza. 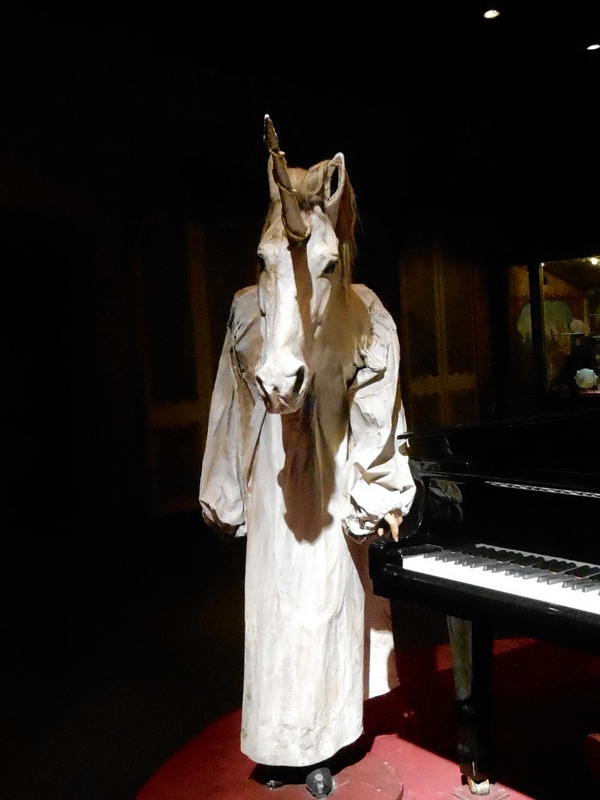 One evening I was the visitor to another rather exclusive and unusual museum in Paris, the Dracula museum. Stuck away in an unlikely setting, you have to walk through rather gloomy surrounding before you reach it. The museum has a garden and among other artifacts of significance to the proprietors , are two graves, ( unoccupied I presume). Contrary to the norm, some of the artefacts have not been tended with loving care and the weather in some cases had done its worst, but no matter. Spread about the garden are objects from previous soirees, goblets left unattended. It was like somebody has chosen to dedicate they garden to the fearful figure of Dracula. If you have a lust for the darker aspects of life Paris will more than satisfy your needs, it is steeped in history, some it might choose to cover up.